Tool kit including an aluminium pocket torch with one Watt LED and a black rubber section, and an eleven piece aluminium pocket knife in matching colour with SS tools, presented in a black gift box with foam inlay. product_features : 15 x 10 x 5 cm. product_materials : Aluminium, Rubber, Stainless steel. product_item_size : 15 x 10 x 5 cm. product_packaging_inner : 20. colours_available_appa : | black | red | light blue | silver . brand_name : The European Collection. 6 Piece stainless steel penknife with rubber pattern. product_features : 9,5 x 2,6 x 1,5 cm. product_materials : Stainless Steel 430, Stainless steel 420. product_item_size : 9,5 x 2,6 x 1,5 cm. product_packaging_inner : 20. colours_available_appa : | blue | red | silver . brand_name : The European Collection. 5 Piece stainless steel pocket knife. product_features : 5,2 x 2 x 0,8 cm. product_materials : Stainless steel, PP. product_item_size : 5,2 x 2 x 0,8 cm. product_packaging_inner : 20. colours_available_appa : | black | blue | red . brand_name : The European Collection. One piece steel and pakkawood pocket knife which is a material of exceptional quality and long lasting beauty. product_features : 11,9 x 2,2 x 1,5 cm. product_materials : Pakkawood, Stainless steel 420. product_item_size : 11,9 x 2,2 x 1,5 cm. product_packaging_inner : 12. colours_available_appa : | brown . brand_name : The European Collection. 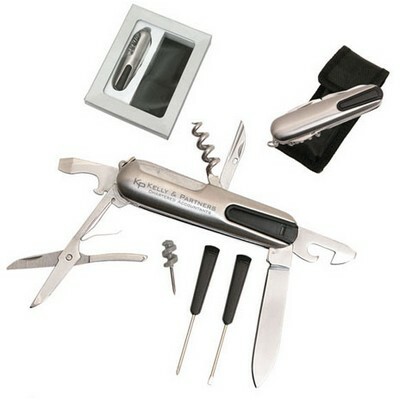 Stainless steel pocket knife with eleven functions. 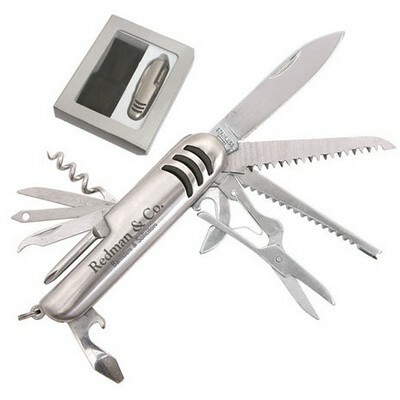 Includes a bottle opener, can opener/flat head screwdriver, corkscrew, Philips screwdriver, two saws, pair of scissors, two small knives, a large knife and a wire bender. product_features : 9,5 x 2,2 x 2,2 cm. product_materials : Rubber, Stainless steel. product_item_size : 9,5 x 2,2 x 2,2 cm. product_packaging_inner : 20. colours_available_appa : | silver . brand_name : The European Collection.